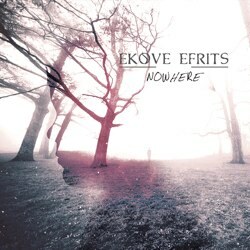 Saman N and his atmospheric experimental black metal project Ekove Efrits is back with his newest masterpiece, the fourth full-length album “Nowhere“. This Iranian one man band from Tehran was formed back in 2001 and its first works were rooted in depressive black metal. The band has experimented a lot since its creation, something obvious in their debut album “Suicidal Rebirth” from 2008. The electronic / classical / trip-hop album “Hypermnesia” in 2010 opened new horizons to Ekove Efrits, who returned in 2011 with the amazing 3rd album “Conceptual Horizon“, released by the Canadian label Hypnotic Dirge Records. The same label published the new work of the band “Nowhere” on 16th of December 2013. “Nowhere” continues the experimental multidimensional style the band introduced in “Conceptual Horizon“. This time though I find the overall atmosphere more solid and coherent. The collaboration with Australian singer Megan Tassaken (Lycanthia, Avrigus), who does the female vocals on this album, adds a very interesting twist in their sound. Her Gothic doom metal past, remaining in the “color” of her voice, fits perfectly with the sad, melancholic and at times depressive atmosphere of the album. I believe she is the best female singer the band ever had; her voice is breathtaking, especially in the more emotional parts. Of course Saman N has still a very important role in the vocals, with black metal screams, clean male vocals and cinematic narrations. In my opinion the songwriting is slightly better, which is not easy at all, since the previous album was a masterpiece too! ”Nowhere” sounds somehow more mature and less abstract, something very difficult for such an experimental effort. The production is improved as well and almost nothing reminds of the early underground days of the band. The 10 songs of the album last for over 52 minutes, moving between atmospheric black metal, electronic trip-hop, post rock, Gothic, ambient and film-score music, among others… If Ekove Eftris’ music should be described by words, then I think melancholy, beauty, quality, atmosphere, originality and experimentation would be the most suitable. The lyrics are in English, written in a poetic, abstract and surreal mood. Fans of this unique band will find in this work the natural evolution of Ekove Efrits’ music. “Nowhere” is a wonderful album, suggested to open minded fans of experimental atmospheric music. It is released by Hypnotic Dirge Records in a limited to 500 copies standard jewel-case edition CD with 16-page booklet, including all lyrics and band bio. Artwork is by surrealist Norwegian artist Jessica Enneby Eldenstjärna and Saman N himself. “Nowhere” is also available in the label’s Bandcamp page, so you can listen to it and decide for yourselves.